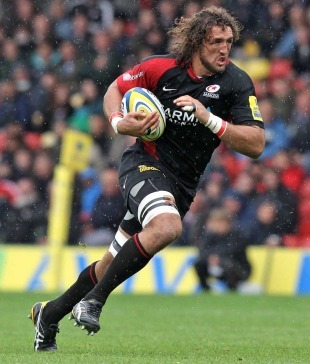 Saracens flanker Jacques Burger will captain Namibia at next month's Rugby World Cup. The 28-year-old Premiership stalwart will spearhead his side's challenge in what will be his second World Cup, having been an ever-present during Namibia's win-less campaign at the 2007 tournament in France. He is joined by 13 other survivors of that tournament including fellow back-row Jacques Nieuwenhuis. Namibia kick off their World Cup challenge on September 10 against Fiji in Rotorua before tackling Samoa at the same venue four days later. They then face defending champions South Africa in North Shore on September 22 and Wales in New Plymouth in their final Pool D encounter on September 25. Coach Johan Diergaardt, whose side notched just one victory, over Portugal, in this year's IRB Nations Cup, has backed his charges to improve on their 2007 showing that included heavy defeats to France, Argentina and Georgia. "We have blended youth and experience and must not be compared with other Namibian World Cup squads as we are the first to spend more than two years preparing for the tournament,'' he said. The squad announcement came just days after Namibia Rugby Union president Buks Bok resigned in protest at a lack of government funding.